With spring comes a lot of new things including lots of updates! The weather is finally warming up here, and I'm gearing up for some outdoor summer projects that I will fill you in on later. First off, the pond is open for 2013! Earlier this week we took the net off the pond. I spent a few hours cleaning out a lot of the algae that built up over the winter and clearing out any debris that made it through the net. The koi were out to greet me and the water is almost warm enough to start feeding them. I start them out with Cheerios at 55F (13C) and move them to wheat germ when the temp hits 65F (18C). 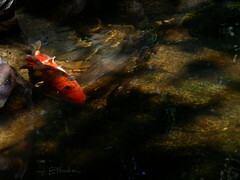 The koi just hanging out in the sunshine. The next major change is a new tank! I removed the red cherry shrimp from my community and set up a tank dedicated to breeding them. My gourami were making it next to impossible to breed them, so I just removed the shrimp. I moved over the remaining adults and later that week found four juveniles hiding in the moss. Thus far the female has released one clutch of eggs and is holding a second. Because the founding population is so small, I'm going to order more red cherries. Too much inbreeding produces shrimp that are far to weak. The plants are mostly stems with some anubias. The plant list: Bacopa carolinia, dwarf sagittaria (Sagittaria subulata), Myriophyllum mattogrossense, Rotala rotundifolia, Anubias spp, riccia, Subwassertang, and java moss. Two males and juvvie eating sinking wafers. There have also been large changed in my community tank. I've finally added the cardinal tetra. I bought 12 from msjinxkd.com. They came in excellent condition and have been flourishing ever since. They are as gorgeous as they are in pictures, and I'm completely in love. The shoal has been dubbed "The Shinies" and my family remarked that they almost look like they are glowing. My new cardinal tetra; I apologize for the dark picture. The other major change in my community has been an addition of more crypts. The dwarf sagittaria (Sagittaria subulata) and dwarf chain sword (Echinodorus tenellus) I had in there was just languishing. I don't know if it was the light or the tannins or just what, but they never grew for me. So I removed what was still alive and placed it in the shrimp tank. I replanted that side of the tank with green wendtii (Cryptocoryne wendtii var green) and red wendtii crypts (Cryptocoryne wendtii var red) and C. spiralis from AquariumPlants.com. I've had minimal melt with them and even see new growth. I'm very pleased with them. You can see them on the right side of the tank. Full tank shot; the bettas are still in the breeder boxes. The first of my summer projects I have begun are my snail bowls. Since my goldfish are growing larger and more apt to eat the smaller snails, I need to grow out my snails before I introduce them into that tank. I have set up two old betta bowls as snail bowls. One has hornwort and the other has anarcharis clippings from my betta tank, and both have a layer of duckweed. Because my water is so soft I have crushed coral substrate to maintain a steady pH and enough water hardness for the plants and snail shells. They get weekly water changes with the waste water being used to water the terrestrial plants in the terrarium window.